Astronomers using NASA’s Spitzer Space Telescope have detected what they believe is a planet two-thirds the size of Earth. The exoplanet candidate, called UCF-1.01, is located a mere 33 light-years away, making it possibly the nearest world to our solar system that is smaller than our home planet. Exoplanets circle stars beyond our sun. Only a handful smaller than Earth have been found so far. Spitzer has performed transit studies on known exoplanets, but UCF-1.01 is the first ever identified with the space telescope, pointing to a possible role for Spitzer in helping discover potentially habitable, terrestrial-sized worlds. 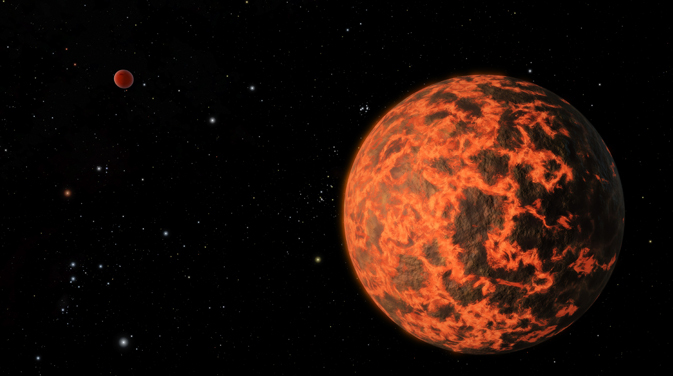 The hot, new-planet candidate was found unexpectedly in Spitzer observations. Stevenson and his colleagues were studying the Neptune-sized exoplanet GJ 436b, already known to exist around the red-dwarf star GJ 436. In the Spitzer data, the astronomers noticed slight dips in the amount of infrared light streaming from the star, separate from the dips caused by GJ 436b. A review of Spitzer archival data showed the dips were periodic, suggesting a second planet might be orbiting the star and blocking out a small fraction of the star’s light. This technique, used by a number of observatories including NASA’s Kepler space telescope, relies on transits to detect exoplanets. The duration of a transit and the small decrease in the amount of light registered reveals basic properties of an exoplanet, such as its size and distance from its star. In UCF-1.01’s case, its diameter would be approximately 5,200 miles (8,400 kilometers), or two-thirds that of Earth. UCF-1.01 would revolve quite tightly around GJ 436, at about seven times the distance of Earth from the moon, with its “year” lasting only 1.4 Earth days. Given this proximity to its star, far closer than the planet Mercury is to our sun, the exoplanet’s surface temperature would be more than 1,000 degrees Fahrenheit (almost 600 degrees Celsius). In addition to UCF-1.01, Stevenson and his colleagues noticed hints of a third planet, dubbed UCF-1.02, orbiting GJ 436. Spitzer has observed evidence of the two new planets several times each. However, even the most sensitive instruments are unable to measure exoplanet masses as small as UCF-1.01 and UCF-1.02, which are perhaps only one-third the mass of Earth. Knowing the mass is required for confirming a discovery, so the paper authors are cautiously calling both bodies exoplanet candidates for now. Of the approximately 1,800 stars identified by NASA’ Kepler space telescope as candidates for having planetary systems, just three are verified to contain sub-Earth-sized exoplanets. Of these, only one exoplanet is thought to be smaller than the Spitzer candidates, with a radius similar to Mars, or 57 percent that of Earth.